Leema Elements pre/power review | What Hi-Fi? The proverb ‘the more the merrier’ might not necessarily be true, and can certainly be disproved by the amount of hi-fi separates you have setting up camp in the living room. The modular approach to system building may not always be the tidiest, but it has merit when it comes to versatility and future proofing that integrated boxes don’t necessarily show. Take the amplifiers in Leema Acoustics’ entry-level Elements range, for example. The pre and power models can be used together in a traditional stereo set-up (as we have here), as well as separately in different scenarios. 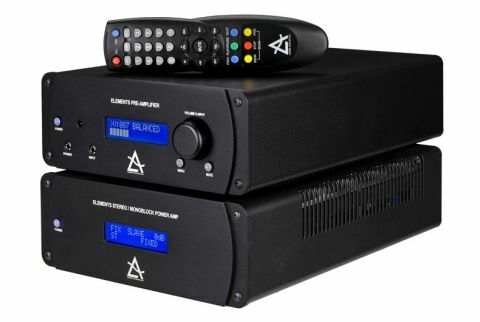 The 55W per channel power amp can bi-amplify an existing integrated amp, go standalone with a CD player or DAC thanks to its internal analogue volume control, or even be used in multiples in monobloc mode (where the output is increased to 210W) for stereo or multi-channel systems. Naturally, the preamplifier, the newest addition to the Elements family, can be used with other power amps too, via its balanced XLR or line-level RCA outputs – logically, they match the inputs on the fellow Leema power amp. But while dependent on some sort of power-providing partner, the preamp’s exhaustive connectivity goes some way to prove its leverage in the relationship. An onboard DAC has three optical, single coaxial and asynchronous USB inputs, all of which support PCM files up to 24-bit/192kHz. Three line-level and a pair of balanced XLR inputs join Leema’s LIPS connections, which allow you to connect Leema components and control them all with one remote. On the front panel are two 3.5mm sockets: an input for portables and an output for headphones. People parting with what could be a down payment on a car might reasonably expect a little luxury, yet Leema seems to have other ideas. Neither box looks anything other than functional, with its industrial-like screws, holes and buttons. Due to the display’s modest size and restricted viewing angles, even the most keen-sighted of people would struggle to read it from across a room; it’s only clearly legible when you’re looking at it level and head-on – not ideal for those with systems in corners of a room. Still, we’ve no qualms with regards to build quality, and their half-width casing means they can be neighbours on a rack shelf without taking up more space than a full-width integrated. The question is: would you want them there? If openness, detail and organisation are high up on your list of sonic priorities, then perhaps you would. Clearly singing from the same hymn sheet, as you’d hope from blood-related components, the well-matched duo has the spaciousness to consume Explosions in the Sky’s Disintegration Anxiety, filling it generously and evenly with the empyrean vibes of the combined instrumentals. Synths drift into one another with purpose and resolution, meandering around keyboards and drums that are also precise in their deployment. There’s comforting warmth to the low-key strumming, and a fair amount of dynamic punch to the crescendo that follows. Move through the album and the Leema’s talents become clearer. There’s the bass depth for droning synths to dutifully anchor the rest of the presentation, the immediacy to keep up with galloping guitarwork, and the transparency to get under the synths’ grubbiness. But when the Leemas are handed a drumbeat they don’t quite snap into it, ultimately undermining the drummer’s aggressive style, and proving a little too polite to truly get across the band’s attacking campaign. The Award-winning Rega Elicit-R (£1600) could give the Leemas a lesson in assertion, putting a more forceful foot forward to drive the piece with greater impetus, and binding the electronic strands and lead guitar rhythms more convincingly. The Parasound Halo Integrated (£2700), too, has more fun factor (not to mention a decent phono stage), marrying greater power and authority with a touch more crispness. The bigger quandary, however, is the preamp’s digital-to-analogue converter. We try the USB input through a Macbook, and the coaxial with our Naim streamer, and compared to the analogue output the presentation is notably thinner, more insubstantial and condensed-sounding. Play Sufjan Stevens’ Jacksonville and the vocal is stripped of the solidity and texture, while the opening longing violin note and subsequent piano lack dynamically. Even the banjo and trumpet – two of the most naturally uplifting instruments on earth – feel uncharacteristically sombre. The DAC lets the Leema preamp down, and while sticking to analogue still doesn’t get you the last word in drive or attack, it does deliver a likeably cultivated approach to music – detailed, organised and precise; the epitome of easy listening. But then, if you are going down the analogue route, and the abundance of flexibility that separates bring isn’t a priority, perhaps it’s worth considering two better performing integrated models in the form of the aforementioned Rega and Parasound.